women's one ski quiver- recommendations? hello all, the time has come to treat myself to some new skis. I need to get out of my comfort zone and start doing a little bit of touring. Was up at Grand Montets yesterday, and looking up at the few tracks coming down from the top bin, and that there will be even fewer in April has got me realising that it is now or never! I am looking at getting some Salomon shift bindings, gvien that the jury seems to be pretty positive on them, and am then looking at , if possible, a one ski quiver. I enjoy piste skiing but no longer ski like a maniac, topping out at around 70km on piste. 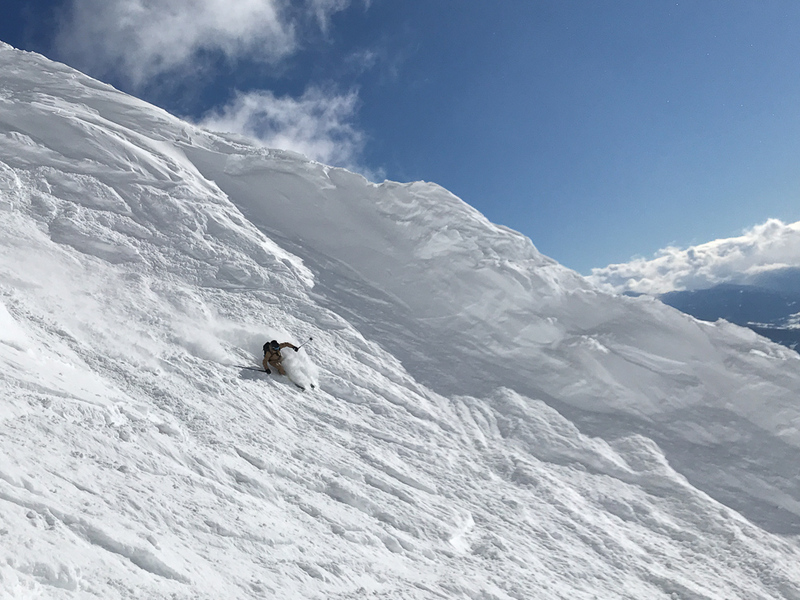 Love off-piste more, although the limited time that I get to do it means that much of what I ski tends to be tracked out- hence moving on to some gentle, day at most, touring. Any women recommend a do it all ski? I am around a level 8 on the Inside Out skiing level description. Will try to test the bottom 2 over the coming weeks, but if anyone already has them or an opinion on something else, that would be great. also seen a really good deal on some 15/16 kastle FX95 (not HP) if anyone has experience of these? @L_555, I love my Zag H-95 Patrol skis and they are closest do everything I’ve ever found. You can test them free at the Zag shop in Argentiere. @Gämsbock, thanks very much- I'll give them a whirl! Kooky loves her Whitedot Director carbonlites, she tours and skis on those a lot, although she has a multitude of skis as well. Nordica Santa Ana is also worth a look. For a single ski solution +1 for the Superguide 95's & Santa Ana. Also suggest the new Whitedot Altum 94. Can't go wrong with the Black Pearl either but look at the 98. All would be great with a pair of Shifts (I don't know your stats but they're a 6 din minimum), Tecton 12's or Kingpins. If you needed any more evidence of their abilities, this skier is on exactly the same 168 Superguide 95s as me! She said “I think they're a little bit soft for me,” but considering how she skis, I'm not surprised. For a normal human, they're perfect. Mrs SL bought a pair of the Blue Pearls as an all mountain ski, after some rather extensive testing. Since buying them she has dumped her Savoury 7s and only uses the BPs in powder. Then she decided she need a second pair of them as touring skis. I think they are a bit heavy with frame bindings, but she loves them. +1 again for the Santa Anna 93. Comfortable on piste and the tiny bit of off piste I've done, bumps, choppy nonsense, etc. If you were after the Hoji's there are some on ebay for a touch under 400 I think - someone's already gone through the pain of importing them for you.. Continuing the trend of smaller ski brands to consider - the little sister skis a Majesty Velvet - 100 underfoot so very much in that all mountain/piste ski territory. I've got the superguide 88s as my dedicated touring ski and I think they ski quite differently to the Zags. I've never skied the 95 superguides so I don't know how they differ to the 88s , but my assumption is less than a totally different ski. The 88 superguides are lighter and stiffer than the H-95 Zags. Not a lot in it on piste. For general offpiste and a bit of touring I'd pick the Zags - they are definitely better in crud being a bit softer. But the superguides are for sure lighter so are definitely better for longer tours if that's what you are planning. I don't own Directors but I've nicked @MaireadOConnor's non-CLs a few times - for me they are fun in powder or slush, but fairly miserable on anything approaching a hard piste so I wouldn't consider them as a one quiver. EDIT: Nor would I want to tour on anything that wide, unless it was a very short/easy section. That’s fair, I bow to @Gämsbock’s superior knowledge on how they ski as I haven’t tried the Zag. @Scarlet, you're welcome to borrow them on the EoSB if you want a go for comparison/interest. @Gämsbock, thanks, we can do a swap if you like. @Scarlet, sounds good, I'd be interested to see what the 95s are like. I have the Santa Ana 100 and love them. Great off piste, and soaks up bumps and crud with ease. plenty of choices there- thanks very much! I've tired of my Directors, I'm afraid. Like @Gämsbock says, they're not great on anything that isn't soft; it's not what they're designed for. Carrying them on my shoulder always runs the risk of turning into a Laurel and Hardy sketch (181 length). I also really dislike the big tail rocker for kick turns (I'm not really tall enough) plus as mentioned 108 is a bit fat for a skin track. They're brilliant for jumps and tricks and landings but I just don't really do that sort of thing. BTW I do have the carbonlites so they're not heavy. This year I got a new pair of Dynastar X96 with Fritschi Tecton bindings which I've had out for two weeks in a variety of conditions. They're 170(ish) and mostly flat tailed which resolves quite a few of those problems. They're much stiffer and with trad camber, so on firmer snow they're miles better. They carve and grip much better than I'd expect a fattish ski to, although it wouldn't be great for your knees to use them predominantly as a piste carver. Off piste they're lovely. I'm very pleased with my choice. If I'm getting the lingo right, I'd say the Director is 'playful' and and the X96 is more of a 'charger'. I've realised that my own personal style is much more suited to a stiffer trad ski. But your taste might be different. @Gämsbock, hi, can I ask where the tip/tail rocker starts on the H95’s; struggling to find specifics on the Zag site? I am coming to the conclusion that my CL Directors are not getting the use they deserve, and I’m considering consolidating my ski collection more towards a ‘one ski quiver’ solution. The Directors are 191, and I’m thinking of going shorter anyway (H95 in 184cm) and will probably have a look at the Altum 94 in 185 at the EoSB, but would be interested in how the H95’s size up, do they ski short etc. @big_ben, I can have a look, how should I measure that? Mine are the H-95 Lady in 168, there is an H-95 mens/unisex which comes in longer lengths which I guess is what you are looking at. I don’t find they ski short. You’re welcome to have a look at EoSB. Well you can ski then if you want but I suspect your boot won’t fit! You could also ring up the Zag concept store in Argentiere, they speak English and are very helpful. The Hoji is full rocker, so maybe not the best for a genuine all mountain ski (as opposed to skinning for good conditions, in which case it would likely be excellent). I'd be surprised if you can find any in Europe - SportsPursuit even used to stock 4FRNT! My GF uses and loves Moment Bellas, although I see they've now changed that to full rocker too. Thanks @Gämsbock, I’d definitely be interested to take a look at the build and shape etc. I would think the 184 is the length. I have been looking for pics online with the skis together base to base just to see where the rocker starts and the amount of camber underfoot. The Zag website shows a fairly flat tail and a decent rocker up front, and a small amount of camber, so on paper, all good. It helps that they look so pretty too!! Well, I have just test driven some Blackcrows Orb Freebird in a 172 with dynafit bindings- they were delicious- made me realise just how little trust I have in my current skis these days! Better get the calculator out..